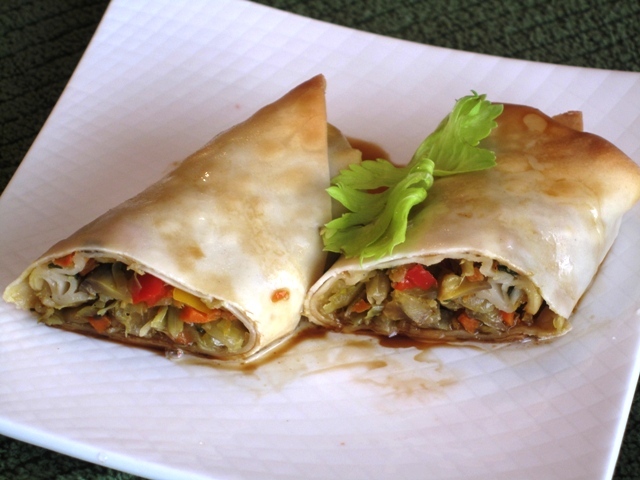 If you love veggie eggrolls, but are looking for a healthier way to prepare them, rather than deep frying, I have just the recipe for you. Have you ever tasted baked eggrolls? Well, I baked mine, and everyone just loved them. They are very tasty. Lots of flavor in the filling. The wrappers are quite crispy, but not “greasy” crispy, thus much healthier for you, so you can enjoy them guilt free! I read several different recipes, and created one to fit my taste. I used regular green cabbage for the filling, and low sodium soy sauce for dipping. Heat up a medium saucepan on stove top with 2 Tbs. of olive oil. Add chopped onions, and saute for 2 minutes. Add shredded cabbage and carrots, and cook until wilted. Season with soy sauce, sugar, ginger and pepper. Set aside to cool off slightly. Using cooking spray, grease the bottom of a baking dish, and set aside. Place eggroll wrapper on a work surface, in a diamond shape. Place 2-3 Tbs. of filling on an eggroll wrap, about 1/2 inch away from the lower corner. Fold the corner over the filling, then fold left and right sides towards the middle, as if making an envelope. Gently holding down all these corners with your fingers, roll the enclosed filling toward the top corner of the wrapper, until fully wrapped. Place the wrapped eggroll, seam down, on the prepared baking dish. Continue same process with the remaining wrappers, until all filling is used up. 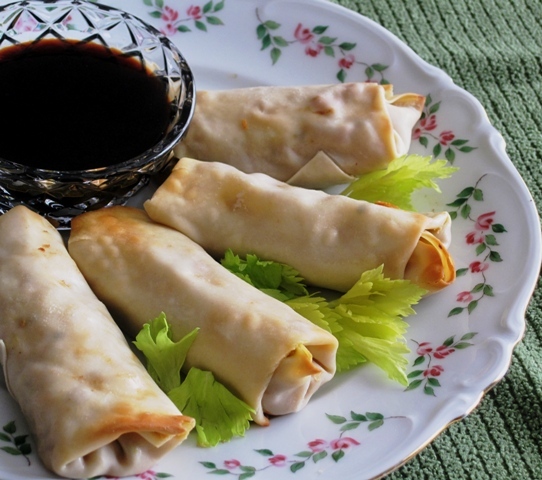 Lightly spray the tops of eggrolls with cooking spray, or brush gently with olive oil. Bake uncovered for 18 minutes, or until golden brown (I could have baked mine a little longer, for a crispier top). Enjoy with the soy dipping sauce, or create your own. To make the dipping sauce, place all ingredients in a small bowl, and mix well with a whisk ,or beat it with a fork. I love these even without the dipping sauce...or with a light sprinkling of soy sauce over each. Great when reheated in a microwave, or for a crispier version....in a toaster oven. Wow, sounds tasty I look forward to trying this one! These were actually very good. The dipping sauce was a little bit on a salty side, even though I used LOW SALT Soy Sauce. Have fun making these, and let us know how you liked them. I found that if I wet the wrappers first they rolled a lot easier. Super good though. Definately making these again and again. Thank you for the tip. I will have to try that next time, since I love them as well, and do make them often. Also, thank you for stopping by and leaving a lovely comment. I absolutely love these for my light lunches or snacks. I am honored to have these included on your site.